When I tell most people I have a degree in public health, the typical response involves an assumption that public health involves caring exclusively for the indigent. I guess if you watched the news you could get that impression as well. Public health is the discipline dedicated to optimizing care for populations. Over the course of my career, I’ve cared for a lot of patients as a physicians, and I’ve actually saved a few lives. However, the work I’ve done as a public health professional has affected millions. The opportunity to work in public health is extremely gratifying. In fact, according to the Centers for Disease Control and Prevention (CDC), the field of public health has been responsible for adding 25 years to the life expectancy of U.S. citizens over the 20th century. 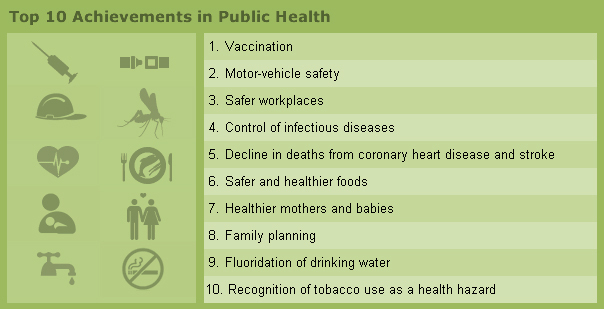 In this post I’d like to review the “Ten Great Public Health Achievements in the 20th Century.” Hopefully, this will cause you to reflect on how these discoveries, innovations and habit promotion affect your life and provide you opportunities to live a healthier life. These are being presented in no particular order. Control of infectious diseases: The combination of hand washing, improved sanitation and appropriate use of antibiotics has saved untold millions. Examples of once prominent diseases being much better controlled include cholera, tuberculosis and even sexually transmitted infections. Decrease in deaths from heart disease and stroke: The combination of risk modification, symptoms recognition and early treatment has contributed to a reduction in death rates by over 50% in the last four decades. Family planning and contraceptive services: Innovations include barrier contraception to prevent pregnancy and transmission of HIV and other STDs, pre-pregnancy screening and counseling, promotion of smaller family size, longer intervals between children and the development of prenatal assessment. Food safety and healthier food production: Food safety has involved reduction in contaminated food sources, better portion control, improvement of nutrition and appropriate components of meals. Fortification of foods has nearly eliminated once prominent diseases such as rickets, goiters and pellagra. Fluoridation of drinking water: Multiple benefits exists including better infectious control and prevention of tooth decay. It’s estimated to have reduced tooth decay and loss by 40-70% since its inception in the 1940s. Healthy mothers and babies: It is astounding that infant mortality rates dropped 90% and maternal mortality rates dropped 99% during the last century. The combination of better prenatal care, technological advances and better hygiene and nutrition all have played an important role. Motor vehicle safety: Seat belts, child safety seats, motorcycle helmets, speed limits, air bags, safer highways and reduction in drinking and driving have all led to substantial reductions in deaths from motor vehicle crashes. Recognition of tobacco as a health hazard: Today there are more former smokers than current smokers and untold million of lives have been saved since the 1964 Surgeon General’s report on the health risks of smoking. Vaccinations: It wasn’t long ago in history when epidemics of measles, polio and influenza were killing tens of thousands of people annually. Rubella, tetanus, diphtheria, Hemophilus and other diseases have been brought under control. Smallpox has been eradicated as a disease due to immunizations. Workplace safety: Elimination of workplace health hazards such as black lung (coal workers’ pneumoconiosis), silicosis, asbestos poisoning and reductions in injuries related to occupational hazards have reduced fatal occupational injuries by approximately 40% in the last 30 years. These efforts don’t occur by accident and shouldn’t be taken for granted. Public health is a clear example of important, appropriate and effective societal collaboration for the betterment of us all. Next time you see a public health professional, give her or him a pat on the back. More importantly, take the time to review the above listing and be sure you’ve incorporated the items into your life.